Hailed the ‘most powerful and luxurious Shiraz ever crafted in South Africa’, the incomparable Black Lion is a result of the masterful alchemy of hand-chosen Swartland and Stellenbosch fruits. 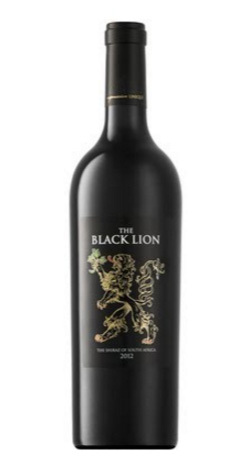 Hailed the ‘most powerful and luxurious Shiraz ever crafted in South Africa’, the incomparable Black Lion is a result of the masterful alchemy of hand-chosen Swartland and Stellenbosch fruits. Taking into careful account soil combinations as well as meso and macro-climates, select vineyards from three unique sites – Swartland, Helderberg and Polkadraai – were earmarked for this complex wine, with the terroir of the first lending it its raw power, and the latter pair its undeniable elegance. Within each allocated area, only the most perfectly balanced, mature and low-bearing vines are chosen and meticulous care then taken of their canopy management – every single vine is visited on a weekly basis by a team of just three dedicated caretakers, each wearing surgical gloves. The very best fruits – those which have been fully exposed to sunlight in the correct locations within the bunch zone – are then selected, resulting in crop yields of a mere 450g (or four bunches) per vine. Picking is done at the point of absolute phenolic ripeness, when the grapes are at their peak concentration and complexity, and harvesting is conducted by hand (six bunches per tray) at sunrise, to retain the cool freshness of dawn. Hand destemming within an hour of harvesting is followed by fermentation in new French Oak and the detailed attention given to the entire winemaking process is ultimately reflected in every bottle. For this is no ordinary wine. Black Lion is a true labour of love, and a wine destined for collector’s-item status.